On Saturday, September 22nd, 2018 at high noon sharp Munich’s Chief Burgomaster – the Lord Mayor – will once again ceremonially exclaim: ‘It’s tapped!’ The Oktoberfest, a festival recurring for the 185th time, has been exerting its magnetism on the crowds since 1810. It means huge fun for regular folks, works as an illustrious place-to-be-seen for celebrities of all shapes and sizes and could even enhance or jog a career of one trade or another. And it serves as a welcome runway for the presentation of suitably traditional garb (such as Dirndl, Lederhosn or Lodenjanker) – or for a rare species of couture whose daring cross-over creations are at times hard to swallow for the more conservative. 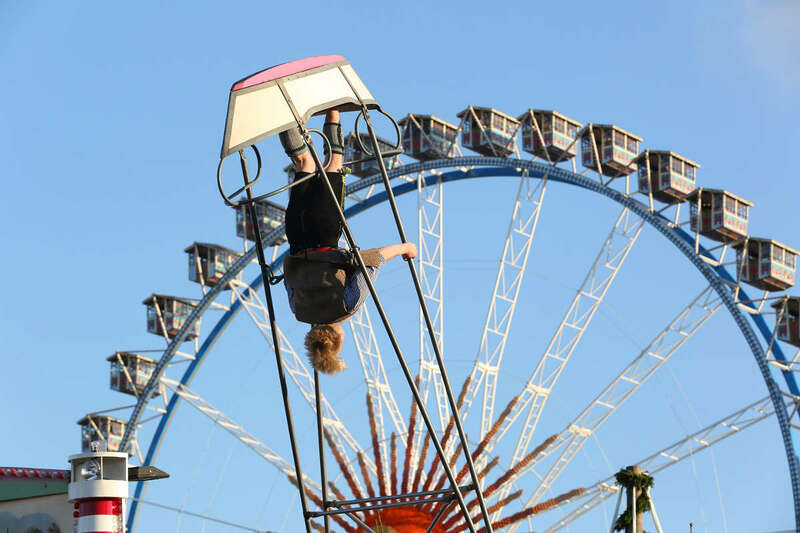 Visitors flock in by the millions for the abundance of attractions in stock – the Ferris Wheel, the rollercoasters, merry-go-rounds, the scooters, shooting stands or swing boats, for the food and for drinking beer by the litre. Whereby „litre“ in terms of „one“ is not the mode in which the steadfast Oktoberfest-goer usually operates: They want it all – and they want it now – even though the “Mass” holding this one litre is not to be had below 10 euros. One doesn’t leisurely sip at a beer, one gulps it down – if there is any stamina at all to be shown off! And those mugs are heavy, mind you! Just ask the waitresses! For visitors determined to keep their five senses together there is ample supply of non-alcoholic beverages to wallow in. 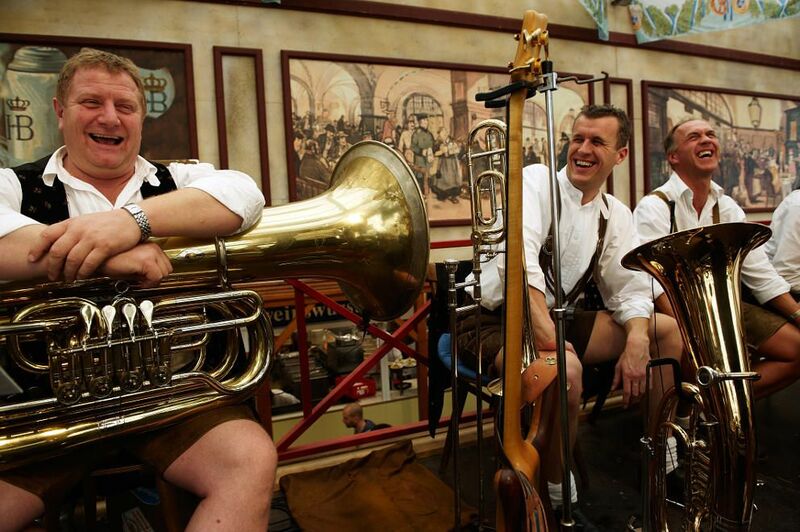 Nibbling at crisp giant pretzels or digging into Knöd’l, Eisbein or a hearty Jaus’n with relish while listening to swinging brass bands – or jollily singing, swaying and dancing along – is what the Oktoberfest is all about. 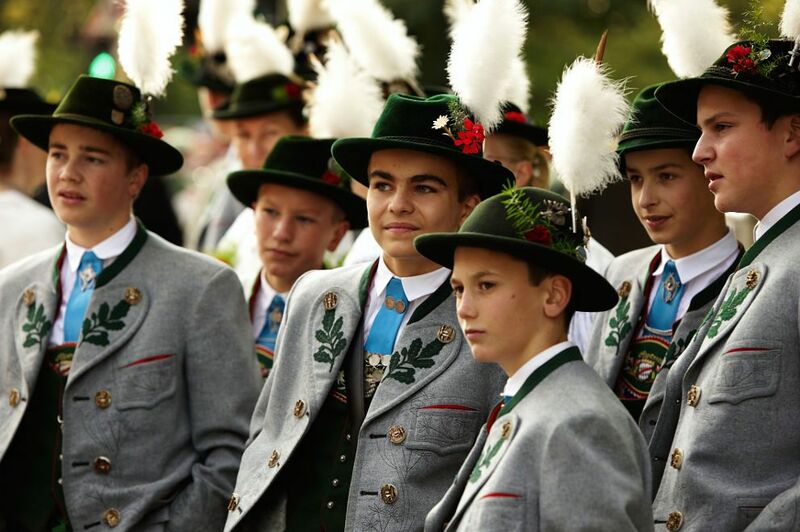 The blissful atmosphere is contagious for sure and those not able to travel to Munich, have cultivated their own ilk of felicitous oktoberfesting. Munich is beyond reach? Oktoberfests work everywhere! Oktoberfests, large or small and definitely varying in authenticity, are being organised the world over, and nations least relatable to idiosyncratic alpine gusto and tradition – such as Arabia, China, Japan or the Philippines, just to name a few – seem to develop the greatest deal of joy with it on their own territory. Often clad in bespoke outfits and seated at checker-clothed tables, a happy occasion is celebrated with maximum dedication and the frequent release of a rehearsed yodeller a liberating therapy for the stressed cosmopolite. And nothing can deter an internationally thinking Beijinger from indulging in their Paulaner beer freshly brewed at a five-star hotel in the Chaoyang district – along with smoked ribs, sausages, steaming Sauerkraut and fragrant pretzels straight from the oven. But that’s a steady institution, a daily sino Oktoberfest light, so to say. When Crown Prince Ludwig (later to become King Ludwig I), wed Princess Therese of Saxony-Hildburghausen on 12th October 1810, all of Munich’s citizens were invited to join the frolicsome party. The festivities held on an open area outside the city gates – the Theresienwiese – were concluded by horse races which again took place in the subsequent year. To boost farming activities in Bavaria, an agricultural show was added to the programme. Et voilà: the forerunner of the Oktoberfest was born. Albeit amusementwise, options were still slim: one lonely carousel and two meagre swings by 1818, sidelined by some beer stalls scattered on site. Supported by local breweries, wealthy landlords had put up first beer tents and halls by 1896 and from there the success story Oktoberfest started to unleash its powerful potential. Today, it is testified as being the world’s largest festival welcoming around six million annual visitors flocking in from all four corners of the globe. And in all likelihood, it is also the most vividly and unashamedly-copied event on the face of this earth. Descendents from the original landlords and brewery owners plus their families are the protagonists of the overture before the festival’s official opening. 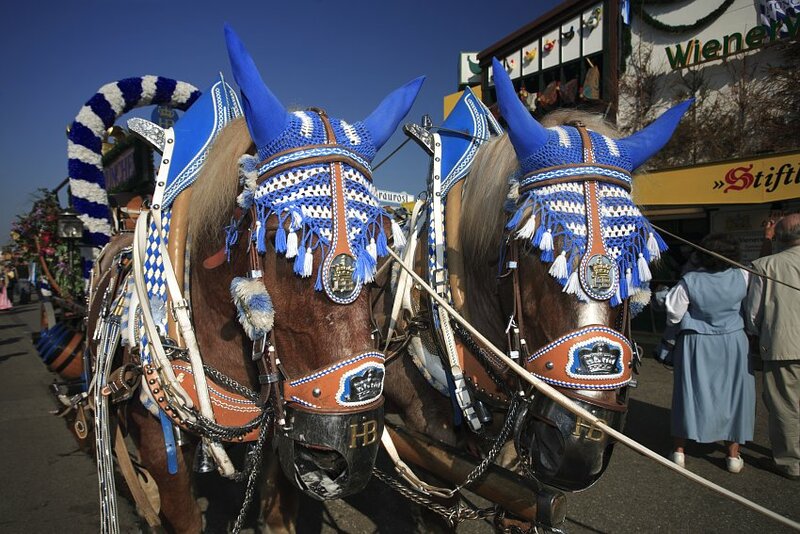 On September 16th, some 1,000 participants, decorated carriages and floats, splendidly adorned horse-drawn brewery drays and the beer-tent bands will show themselves in a 45-minute procession starting at Sonnenstraße at 10:45h. Next day, on September 17th, the Costume and Riflemen’s Parade involving some 9,000 performers are parading over a seven kilometre stretch: A procession of groups in regional costumes, “troops” in historical uniforms, said riflemen, marching bands, thoroughbred horses, oxen, cows, goats, the decorated drays of the Munich breweries, floats displaying typical local traditions and historic carriages all pass by. What does it mean? Learn some Bavarian and become an insider! Wies’n – is the Bavarian way of pronouncing „Wiese“ (wi:sə = a meadow). Zuagroaster – (tsu’agroastə) – non-locals Saupreiss – (sowprice) – every non-Bavarian on the planet Festzelt - the tent on a fair site like the Oktoberfest’s (z = t͡s) Mass - the traditional beer mug that contains one litre of liquid Schunkeln – linking arms to sway (and sing) along with the music Schuhplattler – (u as in shoe) – a folk dance where performers clap the soles of their shoes with their palms while skipping up in the air. Lebkuchenherz – (lɛbˈkuːxənhɛrts) a gingerbread heart heavily decorated with sweets and writing in icing sugar. Knöd’l – (knœdl) – a dumpling Eisbein - (icebine) a leg of pork Jaus’n - (ya’ʊsn) a snack, mostly consisting of ham, sausage, cheese, bread, and perhaps some radish Dirndl – (i as in fit) the traditional dress ladies wear in alpine regions. It allows them to display their female loveliness pushed up over the low-cut rim of a generous neckline. Dirndl also simply means “girl”. Lederhosn – (lɛdəho:sn – s + p) robust trousers made of leather featuring a buttoned front (the legendary „Hosenstall“) often embroidered for beautification. The more worn, the more treasured Lederhosn become. Some – now soft and shiny – have been passed on over generations. What do the various tents offer? A selection: The Augustiner Festzelt is one of the most rustic and run by Munich’s oldest brewery. The beer served here is still tapped directly from wooden kegs. Armbrustschützen-Festhalle can accommodate up to 7,500 guests. It is managed by a local shooting club and is venue to the crossbow championships held here during the Oktoberfest. The meat on the menu comes from their own livestock. Fischer-Vroni. For visitors looking for a quieter place and food beyond the usual Oktoberfest delights, this is the place. They’ve also got Bavarian Steckerlfisch (fish on a stick) – a typical speciality. Hacker Festzelt with its famous white and blue ceiling is Bavarian as can be. The tent the size of a football pitch provides room for approx. 9,300 people and can be opened up in fine weather. Hofbräuhaus Festzelt’s enormous ceiling is decorated with 16 tonnes of hops, in whose centre Angel Aloisius grumpily sings his hosanna to max. 10,000 people. The Wies’n Schänke run by the delicatessen company Käfer is made from solid wood similar to an old farmhouse. Indoors and outdoors it offers space for max. 3,000 guests. They’ve got Champagne here as well! Kufflers Weinzelt. This wine tent comes in a different look. Whereas neighbouring tents are equipped with long benches, here an ambience reminiscent of a Franconian wine garden was created for the lovers of a good drop of wine. One must not miss the Löwenbräu-Festzelt with its tower 37-metres high. Up above the entrance squats a mighty lion roaring “Lööööwenbräu” every few minutes. Seats 5,800 inside, 2,700 outside. The Marstall-Festzelt is a first-timer erected in the stead of the former hippodrome. The new tent is horse-themed and can seat about 4.000. The Paulanerbräu Zelt sports a huge beer tankard on its top. This tent welcomes a large number of regulars – such as the football pros of FC Bayern Munich. The clientele is more senior and the atmosphere and just a little less frantic. 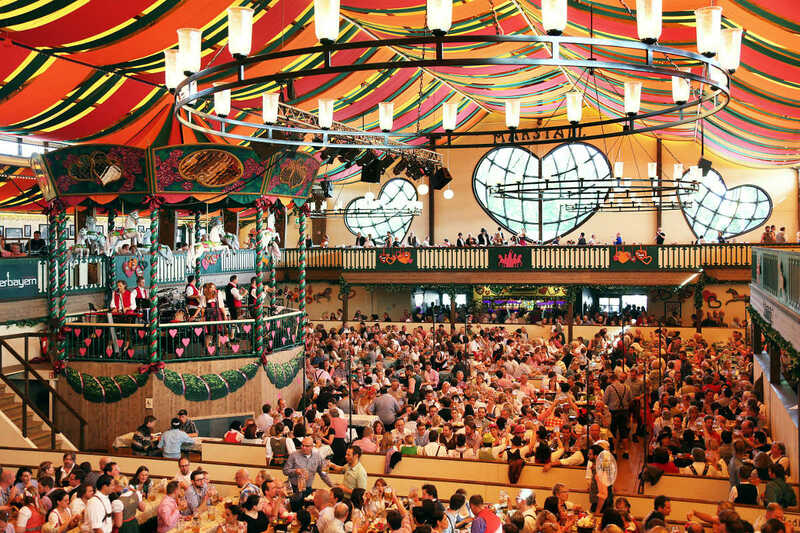 Pschorrbräu-Festhalle (Bräurosl) stands for musical entertainment and features its very own female yodeller. Recently, the tent has established itself as the meeting place of the LGBTI community on the first Sunday of the Oktoberfest. The Schottenhaml is the oldest and most traditional tent reaching as far back as to 1867 and predominantly frequented by the younger generation. It is here where the annual ritual of the tapping of the first keg of beer is performed by the Lord Mayor of Munich. At the Schützen Festzelt (holding 700) the traditional Oktoberfest shooting competition of the Bavarian Sport Shooting Association takes place and guests can watch the spectacle around the 110 shooting stands. Spatenbräu-Festhalle (Ochsenbraterei). Oxen have been the focal point of the Ochsenbraterei for the past 130 years, with around 90 of the carefully selected oxen being consumed over the course of an Oktoberfest. Traditionally, the first ox dished up at the festival bears the name of the butcher, the last one the name of the chef. Next to the regular hotel, which might be dear during the Oktoberfest, there are low-priced alternatives for those not wanting to spend more money than necessary: at B&Bs, hostels or the inexpensive Oktoberfest Camping site in Munich-Riem, with frequent subway connections to the festival grounds.